Bloom, John A. 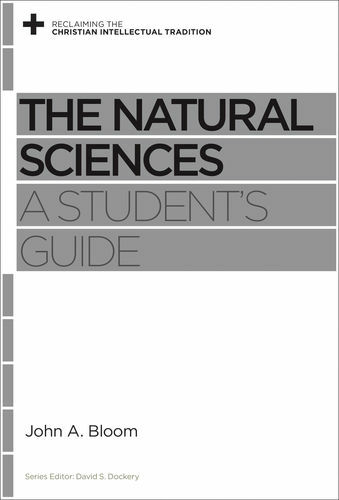 The Natural Sciences: A Student’s Guide. Wheaton, IL: Crossway, 2015, 127 pages, $11.99, paperback. John A. Bloom (PhD, Cornell University) is a professor of physics; chair of the chemistry, physics, and engineering department; and academic director for the M.A. in science and religion program at Biola University in California. His educational credentials make him uniquely qualified to address the relationship between science and religion as he holds not only a doctorate in physics and ancient near eastern studies, but also a masters in divinity. Bloom has contributed to several books including Evidence for Faith: Deciding the God Question (ed. John Warwick Montgomery), and published multiple articles on early creation myths, intelligent design, and human origins. This book is part of a series entitled “Reclaiming the Christian Intellectual Tradition,” which is dedicated to providing an examination of academic topics from a distinctly Christian perspective. The purpose of this volume is to introduce students to the natural sciences, and equip the reader with evidence that the Christian worldview provides the best grounds for scientific investigation. Bloom’s passion, which sets the tone for the entire book, is best demonstrated by his statement that “reflecting on God’s handiwork in the world around us gives a depth and life to science that makes it all the more fascinating and rewarding” (p. 6). He begins the book with an outline of the Christian intellectual tradition within science, and this establishes the philosophical framework for the following exploration of the history of scientific spanning from Aristotle through modern times. Next, he examines the definition of science and how methodological naturalism conflicts with Christian theology. Lastly, he delves further into current obstacles in science and offers suggestions on how the Christian perspective is the most advantageous for future scientific advancement. This text’s greatest strength is the well-constructed foundation Bloom provides on the role of Christianity in science. Having a strong base to call upon is crucial for novice students who wish to start thinking and speaking clearly about the intersection of science and Christianity. It can be difficult in today’s world to be a both scientist and a Christian, however modern science is widely accepted as having its roots in a Christian perspective on nature. Bloom acknowledges that many argue that these two states are not only incompatible but almost considered at war with one another. To address this argument, he calls attention to the fact that both Christianity and science hold very similar, overlapping values: they both place a great premium on good work, which by definition includes high ethical standards, collegiality, and hard work. He highlights this intersectionality by emphasizing that “the Bible teaches that the study of nature is a worthy pursuit to gain wisdom and glorify God” (p. 25, italics original). He further strengthens this claim by noting “the application of scientific knowledge for practical and beneficial ends has its root in the Christian call to relieve suffering” (p. 26, italics original). In the final two chapters of the book Bloom explores the current obstacles in understanding science from a Christian perspective and suggests possible solutions. It is here that, in this reviewer’s opinion, some of Bloom’s arguments become a bit weak. For example: when describing the current limits of science in explaining the natural world he states “there is no rational reason why math and logic correspond to the physical world, and our lab measurements can never be precise enough” (p. 76). This position insinuates that precise answers to certain questions will forever be out of humanity’s reach. Several chapters earlier Bloom himself contradicts this argument with the statement that “Years of work and study are necessary to develop the equipment and the mathematical tools that allow us to model what exactly is happening in the physical world” (p. 27) implying that though perhaps we do not currently possess the tools to fully comprehend the world, hard work and patience will yield the necessary equipment for greater understanding. He also points out that the Scriptures portray God as “designer, sustainer, and caregiver of his creation” (p. 30), thus offering the argument that all of the known universe is God’s creation. From this perspective, one can extrapolate that all of science, and therefore all scientific results, fall within His kingdom. Consequently, the limits of our knowledge are defined by God, and claiming that our equipment can never be precise enough suggests that humanity has the ability to act independently outside of God’s creation to examine creation itself. Fortunately, these faults are minor and detract only slightly from the valuable suggestions Bloom offers; such as recommending tolerance for diversity of theological and scientific view points, and a reminder that displaying Christian character and values in work, scientific or otherwise, is critical for modeling a positive example for others. 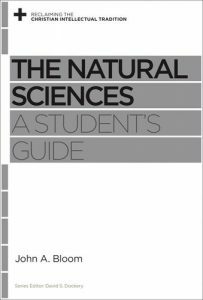 For budding scientists or students of biblical and theological studies, I recommend The Natural Sciences: A Student’s Guide as it combines an easily digestible, historical overview of the Christian intellectual tradition in science that additionally provides a strong conceptual framework for understanding current scientific debates. I would also recommend this book for more advanced scientists who are searching for assistance with reconciling the expectations of being a Christian in science. For further reading into the early history of Christianity’s role in in modern science one may also wish to read James Hannam’s The Genesis of Science: How the Christian Middle Ages Launched the Scientific Revolution (Regnary Publishing, 2011). Alternatively, for further reading into the debate on the role of Christianity and God in more current scientific research John C. Lennox’s God’s Undertaker: Has Science Buried God? (Lion Hudson, 2009) is an excellent resource.